Cannabis grown in soil offers many benefits over alternative methods. 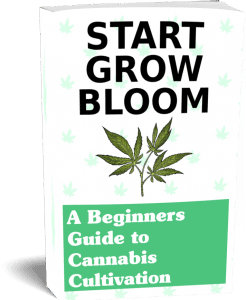 Marijuana is a resilient plant that will grow almost anywhere in the world. Its natural environment is outside in the ground like all other plants. Why complicate things with hydroponics when you can grow in the medium cannabis was evolved to grow in. The trick to growing in soil is having the right nutrient-rich soil mix. Using soil dug up from the backyard is a very bad idea. The best soil mix for marijuana is made up of living and dead organic material, many mineral particles, all incorporated with air and water. The soil is where your roots breathe and feed on air and nutrients. 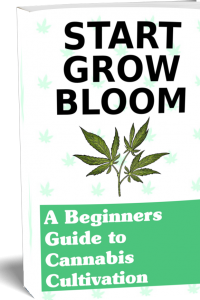 When attempting to grow your own marijuana plants it’s is good to have an understanding of what separates the best soil for weed from bad marijuana soil. The major factors of texture, pH and nutrient content govern the ability for your roots to grow and retain nutrients from the soil. Let’s go through the building blocks of the best soil for cannabis possible. All good soil starts with the right texture. Good soil should also have space for the roots to grow. Good drainage so your roots don’t drown and rot. No big clumps of matter or over packed soil will are also important. Using soil that has lots of clay, or is very packed won’t do your plants any good. The roots have nowhere to go, and it doesn’t drain well. Bad drainage means roots will be submerged in water for long periods, this makes for sad suffocated roots. Never pack your soil tight. Also, the faster a soil drains the more often you will have to water your plants. You want a soil that isn’t too sandy either. Soil like this will slowly wash away every time you water your plants. A nice mixture of different sized particles is just right. In general, the best soil for cannabis should be “crumbly”. A method to check for good soil texture is to pick up a handful of moist (not soggy) soil and give it a squeeze. It should barely stay together and have a spongy feel. 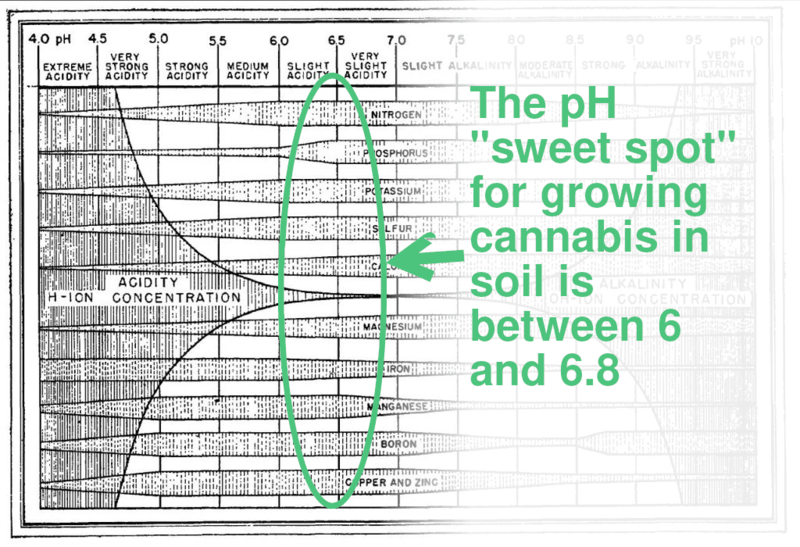 Marijuana plants flourish when the soil pH is between 6 and 6.8. Maintaining the pH in soil is much easier than any other growing medium. 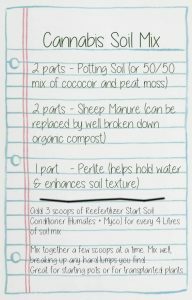 Things like manure and compost in your soil will act as a buffer and help keep the pH in the optimum range. When feeding your plants, make sure the solution your adding is also in that range. The pH of most commercial potting soils falls into the range of 6-7. It’s easier starting with soil in that range than trying to adjust the soil after with commercial products. Measuring and recording the pH yourself is a crucial skill to avoid any problems before they become worse. An incorrect pH may result in symptoms of nutrient deficiencies. This is called “nutrient lockout”. Your plant won’t be able to absorb certain nutrients if the soil is too acidic or basic. There are many tools to measure the pH of the soil or feeding solution, some work better than others. Sometimes it can be hard testing the pH of runoff water with a litmus or similar test because the water won’t be clear. Because of this, digital pH meters are a good tool to have around. Digital meters work by testing the runoff water and displaying its pH level on an LCD screen. We offer a simple cheap digital pH meter in our store. Maintaining the pH level of your soil will facilitate the efficient uptake of nutrients in the roots from the soil. 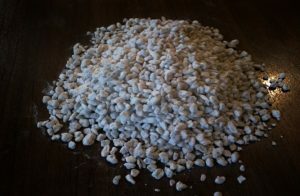 Perlite is a popular soil amendment. Nutrients in the soil will play a big factor in the success of your plants. Adding things like worm castings, manure and compost can really help your plants grow. These additions contain minerals and fertilizers that your plant will need to feed on while it’s growing. 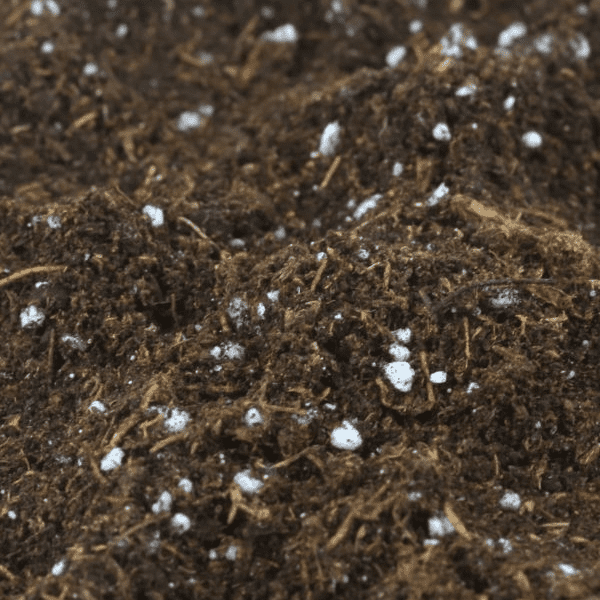 Inert substances like perlite help the texture of your soil by holding water and air. 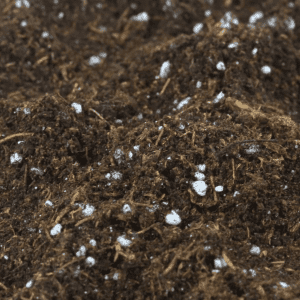 Many growers will add mycorrhiza, a fungus, to their soil mixes. Because of mycorrhiza’s ability to help protect roots and enhance their ability to take in water and nutrients, it has been a popular addition in the last few years. 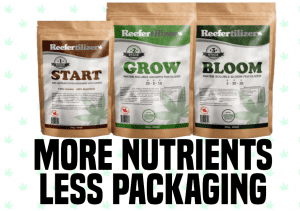 Products like Reefertilizer Start nutrients contain Mycorrhiza as well as humates, it makes a great addition to soil mixes when used correctly. Humates and humic acid are the results of the breakdown of animal and plant life over a long period of time. Humates contain a complex mix of concentrated nutrients and compounds that stimulate growth and plant development. There are lots of things that you can add to the soil to help improve your crop. Looking online for what other growers do and be quite interesting. My father swears by adding eggshells to his soil mix. There are alternatives to using soil, like coco coir and soilless mix. Most growers usually create their own special mix of soil, nutrients, and amendments that works best for them. 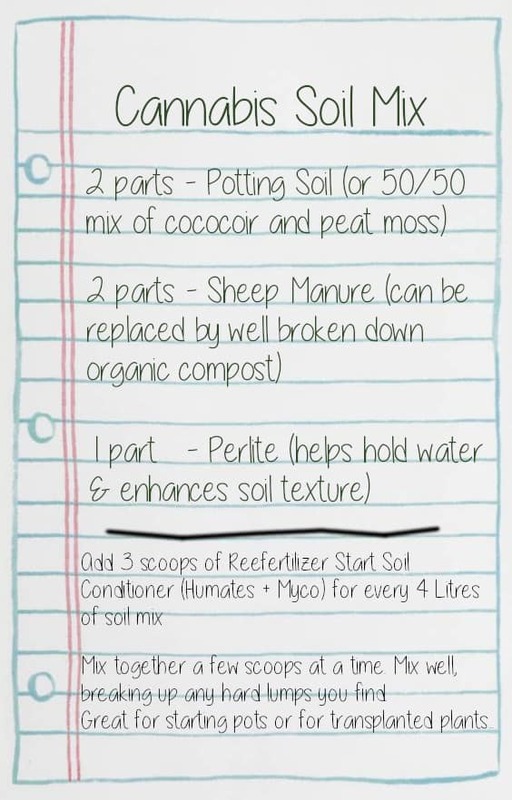 As an example, on my last grow I used a soil mix that contained half potting soil and half sheep manure. I also added perlite and Reefertilizer Start soil nutrients. Each one of these ingredients affects the soil texture, nutrient content, and it’s ability to keep the pH balanced. When working on your own soil mixes remember to take into consideration the three most important factors: Texture, pH, and nutrient content. Experiment to find your best soil mix for marijuana plants. 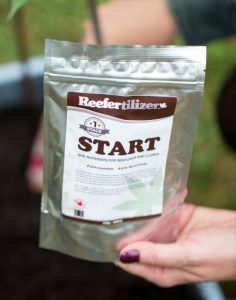 Here's a simple recipe for cannabis soil that's easy to put together.